With spring training quickly approaching, we will be writing this series of pinstripe previews while simultaneously publishing prospect features each day. Our first preview of the first player on the 40-man roster (in alphabetical order) is young third baseman Miguel Andujar. Andujar is a player who quickly saw his prospect stock rise in 2016 as he began the season unranked on our list, but you will eventually see the high praise he will be given heading into 2017. Blocked by Chase Headley at third base, Andujar may not make his debut until September. As a prospect who is developing into a solid bat with an incredibly strong arm at third base, Andujar could be the beneficiary of some big league consideration earlier than expected this season. 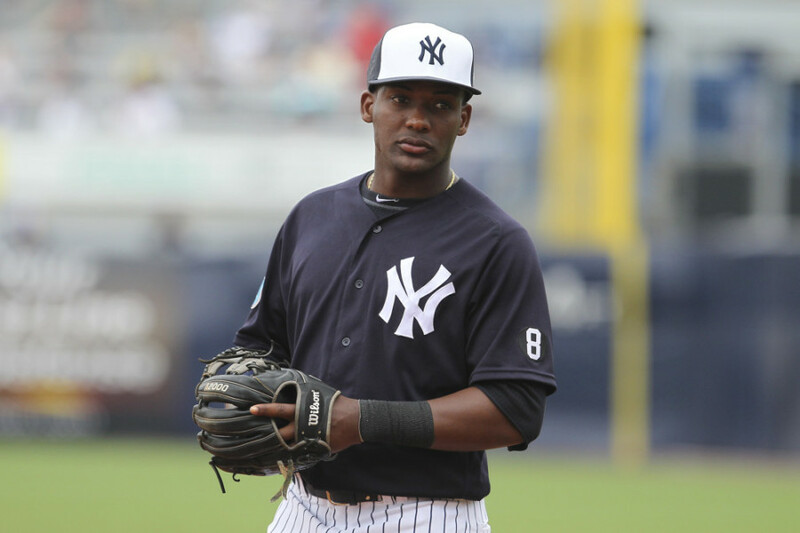 Andujar began the 2016 season where he left off 2015 with the high-A Tampa Yankees. 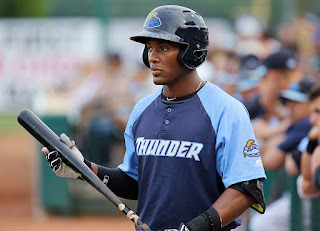 Andujar played 58 games before being called up to Double-A Trenton after hitting to a respectable .283/.343/.474 slash line with 10 home runs, 41 RBIs, and 10 doubles. Upon his call-up to Double-A, Andujar cooled off a bit, but still managed to hit to a .266 clip. His one area of concern following the call up was his two home runs in 72 games, but playing at the youthful age of 21 (3.3 years younger than the average AA player), this is an area he should improve in going forward. Andujar put together a nice fall league showcasing his offensive tools, hitting to an encouraging .284/.364/.373 line. Scouts have begun taking notice of Andujar's potential. "Andujar really has come on. He reminds me of Phillies third baseman Maikel Franco, who's a very good young player. When I saw Andujar last year in Tampa, there were a lot of strikeouts, a lot of bad at-bats. When I saw him this year in Trenton, I thought, 'The lightbulb went off for this kid.' I think he's actually a little better defensively than Franco. They're both toolsy kids who are improving because of their work ethics," an American League scout told NJ.com. MLB Pipeline also had this to say about the young prospect. "Andujar has a quick right-handed bat that generates impressive raw power, though interestingly most of his pop currently comes against righties. He makes repeated hard contact, though his aggressive approach sometimes leads to him getting himself out on pitches he'd be better off avoiding. He has the upside of a .270 hitter capable of 20 homers on an annual basis." As a player projected to eventually be a .270 hitter with 20+ homers, Andujar looks to eventually become an upgrade over the Yankees current third baseman Chase Headley. Turning 22 in March, Andujar is not quite there yet and will look to getting to Triple-A by midseason. Andujar should have little to no impact at the big league level in 2017. Being blocked by Chase Headley, Ronald Torreyes, and even Rob Refsnyder, Andujar may be a season or two away from seeing consistent playing time. Still, the Yankees hope he will progress through Trenton into Scranton this year showcasing his incredible arm all the while getting better at the dish. "This is a guy who can drive the ball to all parts of the field. He hits the ball with authority. He is a gap-to-gap hitter, and he’s going to be able to hit with some power," minor league hitting coach Carlos Mendoza told Yankees on Demand. As a raw talent, Andujar should continue to rise on Yankees prospect boards with a few players ahead of him graduating off the list this season. Expect Andujar to start the season with the Trenton Thunder before being called up to the Scranton/Wilkes-Barre RailRiders by midseason. Being on the 40-man roster, we should also see Andujar being called up in September, all barring he remains healthy in 2017.